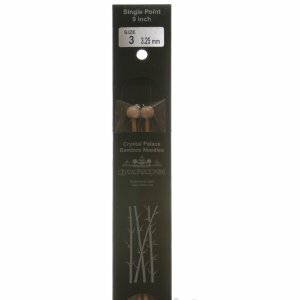 These smooth, strong bamboo needles are great for any project worked flat! Please note: All CPY needles labeled US 6/4.0mm are truly US 6/4.25mm needles labeled US 19/15.0mm are truly US 19/15.6mm. Knitter's Pride Zing Single Pointed Needles and Brittany Black Walnut Victorian Single Point Needles are both similar needles: straight and US 13 (9.0mm) US size. You may enjoy taking a look at the Berroco Comfort Chunky Wee Willie Layette, Berroco Comfort Chunky Striped Blanket, Berroco Comfort Chunky Garter Stripes Afghan, and Brown Sheep Lamb's Pride Bulky Prairie Boots kits all using Crystal Palace Bamboo Single Points Needles. Knitter's Pride Naturalz Single Pointed Needles From $8.60 to $12.29Select options on sale now! Knitter's Pride Royale Single Pointed Needles From $13.08 to $18.69Select options on sale now!